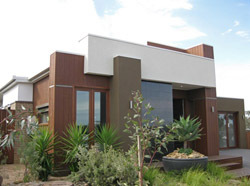 Australia has it's first 'zero emission home' (AusZEH) located in Doreen, in the northern suburbs of Melbourne. The home is expected to use up to 70% less energy than a traditional home and has an eight star energy rating as well as a water recycling system and a 6kW solar energy system. The eight star rating is achieved through double-glazed windows and doors, solat hot water system, and insulated waffle pod, although the house is brick veneer construction. The house is the result of a colaboration between the Henley Property Group with the CSIRO, Sustainability Victoria and Delfin Lend Lease. The home has a specially designed central control system which analyses trends in energy use and suggests ways to reduce them. The system can also be operated remotely, even from overseas. The house is to be occupied by a typical family for the next 12 months, with their energy usage to be tracked. The performance data from the house will be used to identify ways to improve the design of sustainable and zero-emissions houses.